Chinese have built in Huangyangtanzhan, a huge model of the terrain of Chinese occupied area of Aksai Chin, India. 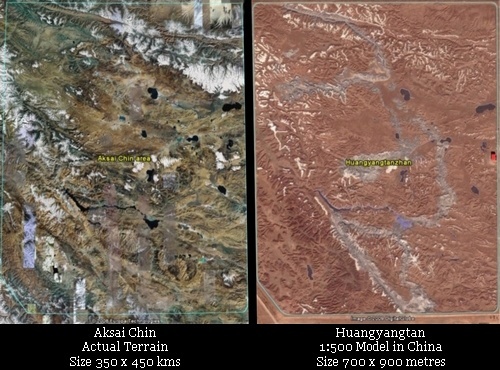 A side-by-side comparison of the larger image reveals uncanny replication of terrain including those of lakes in the Aksai Chin area. No one knows why chinese spent time, effort and money to make this detailed and almost exact model of a very desolate, almost uninhabited area which has no permanent settlement. 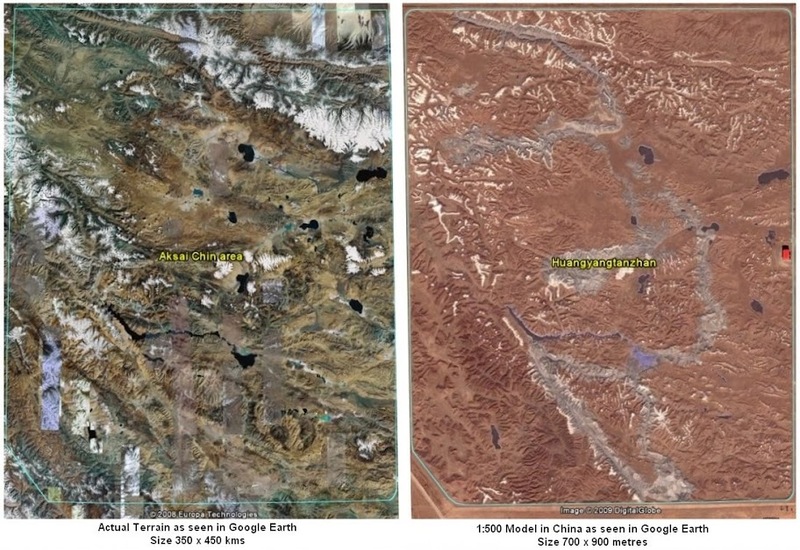 View in Google Earth (Note: Being large file (4.96 MB) there may be problem in viewing directly in Google Earth. Please use right click and save the the .kmz file on your disk then click on it to view it in Google Earth. Credits: KenGrok for finding it and PriceCollins for side by side comparison overlay. Click here for original post in Google Earth Community. heh - that's pretty funny - I never thought about it at the time, but I spotted this and blogged about it a week before the post of KenGrok's that you point to on the Google Earth Community. Given that I also attribute KenGrok there must be another earlier post of his somewhere that gave the clues. Interesting stuff. KenGrok's original post in Google Earth Community was made on June 29, 2006. At that time he had not identified that the model represents Aksai Chin. He notified about this in his subsequent post dated Jul 14, 2006. Price Collins comparison appeared in the BBS on September 4, 2006 which is later than WooWooWoo's blog on the subject which is dated August 7th, 2006. I have given credits to Price Collins since I was not aware of WooWooWoo's blog at the time of making my post. It may be due to the fact the kmz files uploaded in Google Earth Community get incorporated in Google Earth Layers and are easily noticed by every user of Google Earth.